The Old Testament prophet Isaiah is writing about the peaceful kingdom wherein historical and sworn enemies share the same habitat, the same sleeping arrangement. They lie down together and they are led to this position by a little child. Perhaps, it is to the children that we should look for leadership when it comes to guiding us, wolves and lambs, amidst the tensions surrounding the tragedy in Ferguson, Missouri. The leadership of one little child named Devonte Hart, an appropriate last name for a boy who clearly has a lot of it, has warmed mine. 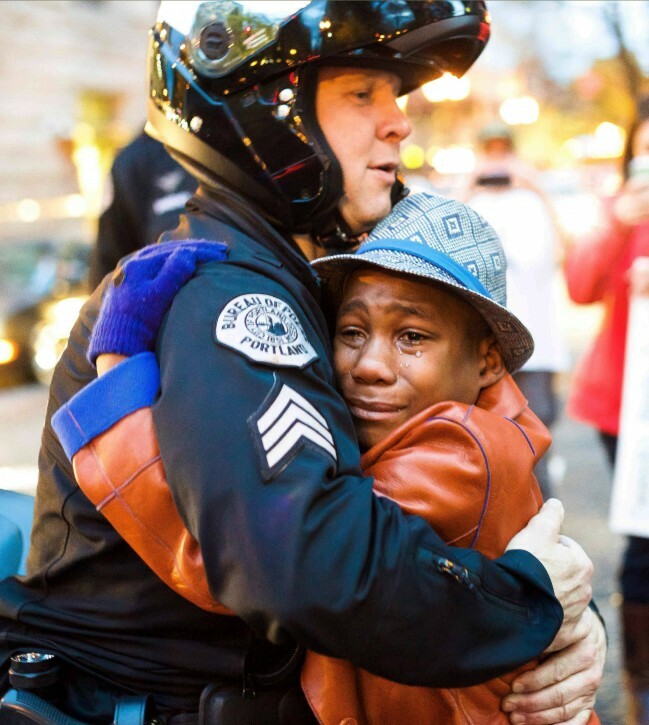 He’s twelve years old and he decided to hold a sign offering hugs during a protest in Portland, Oregon in support of Ferguson this past week. And someone took him up on it, a police officer: Sgt. Bret Barnum. I need a hug right now.